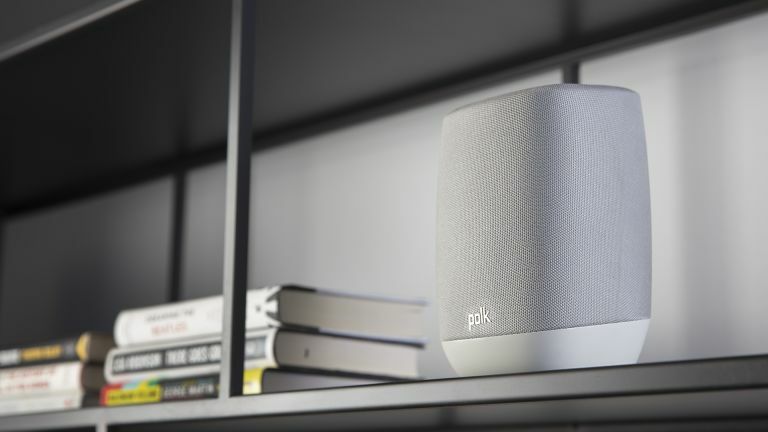 With the continued absence of Google Home Max in the UK, other companies are jumping in to offer Google Assistant smart speakers that actually make the music you ask for sound good, and the Polk Assist is your latest option. The Assist is similar in size to speakers like the Sonos One and HomePod, and packs a one-inch tweeter and 3.5-inch woofer for much better audio quality than you get from Google Home. It’s got Chromecast built-in too, so you can easily stream music to it from another device, and this means it’ll fit right into a Chromecast multiroom setup. Alternatively, it also has Bluetooth for streaming tracks. On top the unit itself, you’ve got buttons for play/pause and volume adjustments, and one for triggering Google Assistant manually, without saying “Okay Google”. A set of lights on top indicate when Assistant is listening in, and when it’s thinking about what you’ve asked. We had a little listen of it, and it’s definitely miles ahead of Google Home when it comes to putting out a sound that’s got punch and detail, though its price is pushing close to the Sonos One, and we’re not sure it quite matches that. To be fair, this was in a conference room, so we’ll reserve judgment until we test it properly in the home. The underlying software of the Assist is Android Things, Google’s developer platform for smart devices, which means it’ll get updates directly from Google in the future adding new capabilities – we’re told that stereo pairing will come to the Assist in this way later. • Polk Assist comes in black or white/grey finishes, and will cost £179 when it comes out soon, this summer.